Over the weekend I visited a course to delve a bit deeper into the various natural fibres available to me as a knitter and weaver. 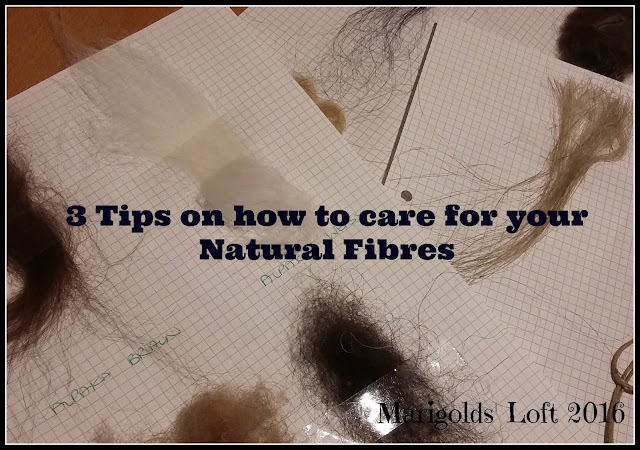 I also managed to pick up some great tips for handling fibers and I thought I would pass some of those on to you, as I am sure some of you may find them as handy as I did! Soak linen before you wash it! Linen or Flax is a plant fibre that loves water and gets its' strength from moisture. To keep your linens relatively crease and crinkle free it is a good idea to soak your linen fabrics and end products before putting them in the washing machine. This strengthens the fibres themselves and helps them to wash easily. By placing the linen fabric dry into the washing machine, you ultimately torture your fibres for a while until they manage to soak up enough water. This allows for breakage of the single fibres which is visible through deep creases which are no longer removable as the actual fibre is no longer repairable! It doesn't like to be thrashed around in a washing machine or scrubbed and wrung out between hands. It likes to be treated with care and to be lightly swished from side to side in some luke warm water. Rinse your silk fabrics in the same fashion and then roll it into a dry towel and press the remaining water out of the fabric. By placing your yarns in an acacia cupboard or drawer you can eliminate fish moths, as they do not like the oils that emanate from the wood. You can also place discs or cubes of the wood in your yarn storage but be sure to sand it now and then so that it can release its' fragrance again. Another tip for your yarns is a bag of lavender buds. This has the same effect as the wood. Freshen your bags with some lavender essential oils now and then. Do you have some tips that you would like to share? Leave a comment below, I would love to hear from you!